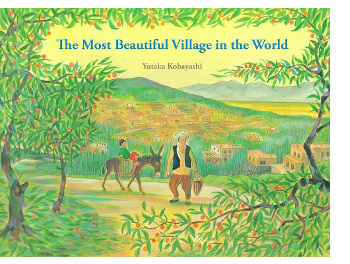 On shelves now, dedicated to “the children of Afghanistan,” is a picture book originally published in Japan in 1995 but brought here to the States (as the first book in a series) just last month — Yutaka Kobayashi’s The Most Beautiful Village in the World (Museyon, October 2018). 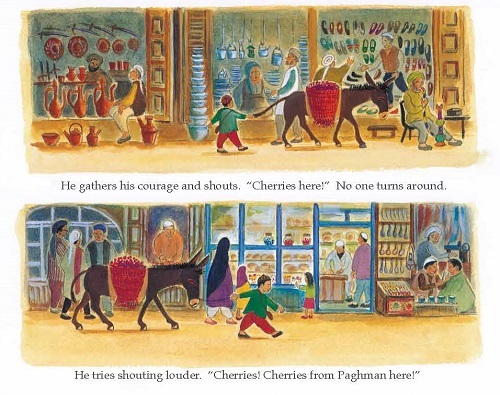 This unusual picture book gives child readers a glimpse into life in Afghanistan, specifically the village of Paghman. Mainstream sources of information don’t provide many ways for us to visualize Afghanistan as anything other than a dusty, war-ravaged place of despair. And while there may be some truth to that, there is another side to this country and its people. “Plums, cherries, pears, pistachios. It’s spring. © 1995 Yutaka Kobayashi. 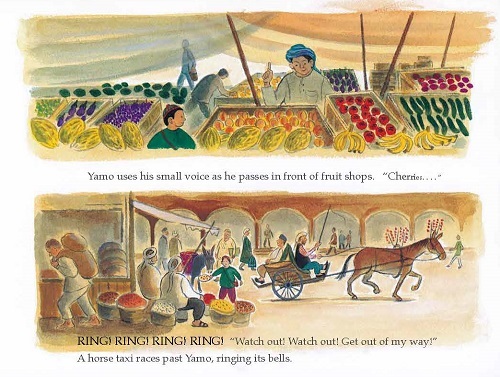 Originally published in Japan in 1995 by POPLAR Publishing Co., Ltd. English translation rights arranged with POPLAR Publishing Co., Ltd. Illustrations reproduced by permission of the publisher, Museyon Inc., New York. Do the scars of wars, like scars from fire, ever grow over and become green and flourishing again? Carl Sandburg assured us that the grass would cover battlefields… but from modern warfare that isn’t WWI, what will return? Sometimes the Middle Eastern lands which have been so utterly ruined make me ill. I am so glad someone remembers the beauty and is willing to remind others that Afghanistan isn’t entirely ugly and filled with war.